PT. 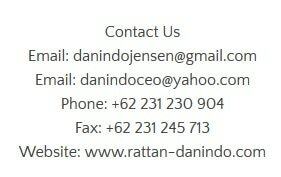 Danindo Jensen is a Danish-Indonesian rattan furniture manufacturer, established in 1994, located in Cirebon, Indonesia. We specialize in producing quality natural rattan, wicker, cane & wood furniture. PT. Danindo Jensen is a rattan furniture manufacturer and exporter that has built a reputation for producing quality rattan furniture for the past 20 years. By using Danish expertise and quality control we are able to produce quality eclectic designs that are manufactured, in our own factory located in Cirebon Indonesia. We use the best materials and manufacturing techniques ensuring durability and comfort at reasonable prices. Our company predominately manufactures natural rattan furniture, wooden furniture and poly rattan furniture in Cirebon, Indonesia. We are continually developing new rattan furniture designs for our customers so please check our website for new rattan designs and cane furniture trend inspiration. Please contact us for access to our online portfolio and for further information about our rattan furniture.